Jakarta, May 8th 2015 â€“ Archipelago International reveals its latest property in South Jakarta, Aston Priority Simatupang. Strategically close to the southern Central Business District (CBD), Fatmawati and TB Simatupang, prominent international business headquarters such as Switzerlandâ€™s Nestle and Siemens of Germany. The hotel offers easy access on off the Jakarta â€“ Bintaro â€“ Serpong toll road ring, to Pondok Indah International Golf Course, and a number of trendy shopping centers. This strategic location makes the hotel become South Jakartaâ€™s premier choices for business travelers on short and long term assignments and is the very best meetings and event location in the area. PT. Nusa Pratama Property as the owning company deliberately builds this hotel as one of the largest conference hotels in the area, offering stylish designed of 296 guest rooms and suites equipped with the sophistications of todayâ€™s technology such as IPTV, free high speed internet connection, and soundproof. 12 full equipment of meeting rooms and a pillar-less Sky Ballroom that can accommodate up to 800 guests. Canary Coffee Shop is located on lobby level offering wide array local and international delights. To satisfy your Japanese food, Momiji Restaurant is the best choice placed on second level, LA Lounge for casual business meetings, a private executive lounge, a swimming pool, spa and fitness center for that much needed downtime. â€œJakarta is such a diverse capital city, with locals and tourists from across the world exploring its culture. This time, the Archipelago brand is opening up in South Jakarta with an address conveniently close to the toll highway, government buildings and financial district area. You can enjoy doing business in this area whilst also enjoying the plethora of dining, shopping and entertainment options. We believe Aston Priority Simatupang will be a nice and comfortable hotel for Jakartans and visitors alike, especially those who enjoy a modern lifestyle and a friendly service when doing great business. This hotel will be the 40th Aston in Indonesia, with 15 upcoming Aston Hotels opening by the end of 2017, continuing our reputation as the fastest growing and most consistent hotel network in Indonesia. You can follow our development at our website, www.AstonHotelsAsia.comâ€ Said Mr. John Flood, President & CEO of Archipelago International. Seen in the image from left to right : Mr. John Flood as President & CEO of Archipelago International, Mr. Kadafi Yahya as President Director of PT. Nusa Pratama Property, Mr. M. Andy Arslan Djunaid as one of the shareholder of PT. Nusa Pratama Property and Mr. Ainur Rofik Mustamar as General Manager of Aston Priority Simatupang Hotel & Conference Center. 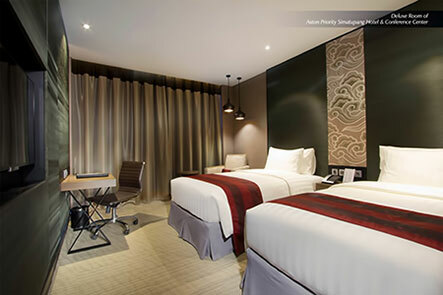 Seen in the image : Deluxe Room of Aston Priority Simatupang Hotel & Conference Center.